You know that time when you restart something there is always a little bit of dread about it. You probably won’t be able to run as fast, finish a task as quickly as you used to or in my case colour inside the lines as well I used to. 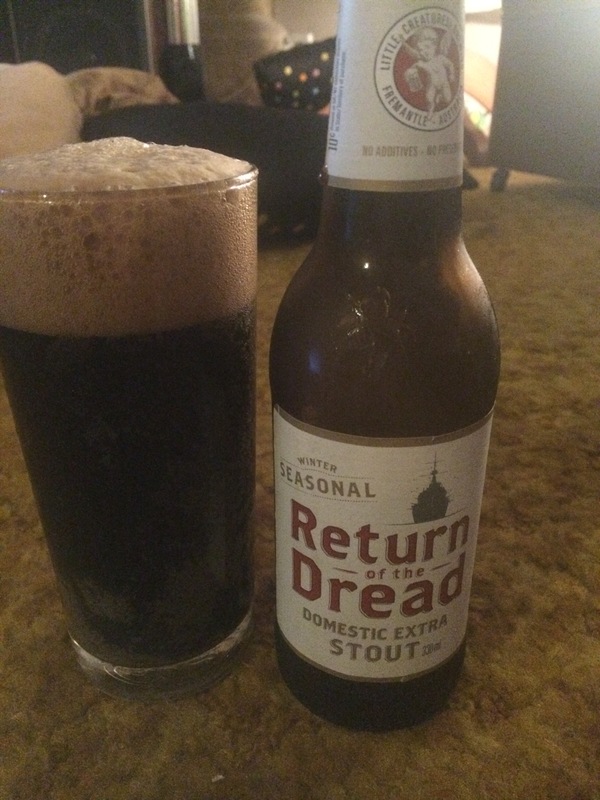 The Return of the Dread owes it’s existence to the first Little Creatures Single Batch, The Dreadnought which was a massive 7.4% dark beer that was enormously popular and for a good reason, it was an excellent dark beer. The second coming of the Dreadnought is slightly muted in it’s 330 Ml form at 7.2% but it is still dark with a strong coffee coloured head which stuck around for a time. So while this beer is not the Dreadnought it is still a very solid and very enjoyable stout which you can pick up from any of the better big bottle shops like a Dan Murphy’s.